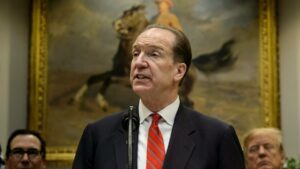 David Malpass has been appointed as the President of the World Bank. He was US President Donald Trump’s nominee and won unanimous approval from the institution’s executive board. He has replaced Former World Bank President Jim Yong Kim who left in January 2019. Malpass was former Bear Stearns and Co chief economist who advised Trump’s 2016 election campaign. World Bank Headquarters in: Washington DC, USA, Established in: 1944.